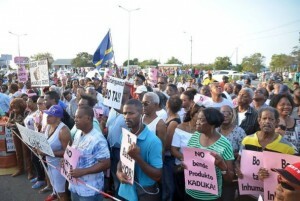 WILLEMSTAD – Yesterday in the afternoon hours a large crowd gathered to protest right in front of the wholesale supermarket Goisco in Biesheuvel. As was recently reported, officials of the multidisciplinary team have confiscated 1000 kilos of meat and other products that are past their expiration date. All these products were stored in a container and last Tuesday the veterinary service inspected all the meats. After their inspection, it became clear that the meat was not spoiled. They still had to get rid of 250 kilos of meat because they couldn’t guarantee its quality. After all the reports in the media, the people became concerned and together with several social groups in the community, they decided to protest and demand an apology from the owners. After the large crowd started protesting, the owner of the wholesale store Joel da Silva Gois came out and apologized. He did this in front of the media and the crowd.